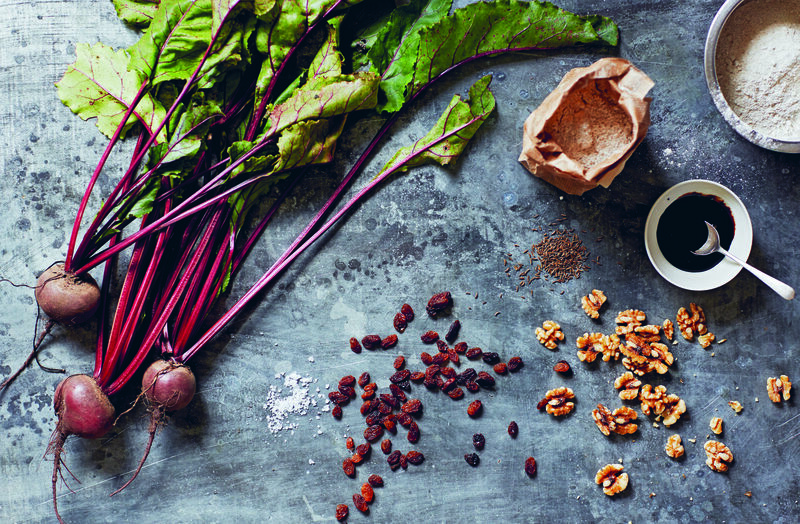 by Henrietta Inman, from "The Natural Baker"
Continuing with our feature of Henrietta Inman, this week we have on the blog her delicious rye, beetroot, walnut, sultana and caraway loaf. You can use a blend of our organic light rye and dark rye flours for a rounded taste in this loaf. 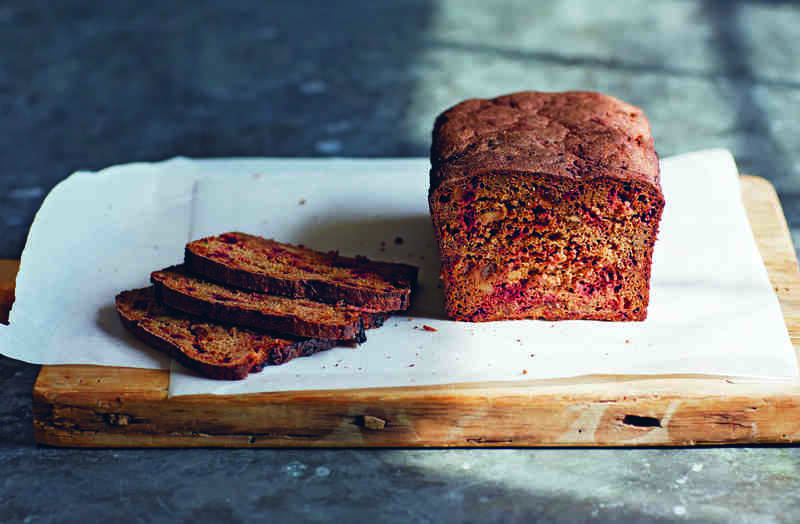 “This loaf is just bursting with nourishing ingredients, flavours and textures, from the complex notes of the slightly sour rye and treacly molasses to the earthy beetroot (beet), and from the crunch of the walnuts and aromatic caraway to the sweet, plump sultanas (golden raisins). As you bite into a slice, with its gorgeous crisp crust and moist-dense centre, you’ll already be cutting the next! As rye contains less gluten than wheat and spelt, it creates a heavier and slightly more dense bread… which is a good thing, in the case of this loaf. I love the taste of caraway seeds, but leave them out if you prefer. Recipe extract from “The Natural Baker” by Henrietta Inman. Published by Jacqui Small, an imprint of The Quarto Group (£20). Available from 22nd March on Amazon. Oil the base and sides of a 900g (2lb) loaf tin (pan) with the oil; mine is 21 x 11 x 7cm (8¼ x 4¼ x 2¾in). Line the base with baking parchment. In a small bowl or measuring jug, combine the warm water, molasses and yeast well. Leave for 10 minutes; the mixture will form a frothy top. Combine the flours and salt in a bowl, then incorporate the sultanas (golden raisins), walnuts and caraway seeds. Add the grated beetroot (beet) to the yeast mix, stir it in, then add this to the dry ingredients, mixing with a wooden spoon. The dough should be quite sticky, but not runny. Place the dough in the prepared tin (pan), smooth out the top with a step or cranked palette knife or the back of a spoon, making sure there are no air gaps, especially in the corners of the tin (pan). Bang the tin (pan) once on a work surface, cover with a tea towel and leave to rise in a warm-ish place for 1 hour; the loaf should just be rising up over the edge of the tin (pan). Preheat the oven to 200°C/400°F/gas mark 6. Bake for 20 minutes. Reduce the oven temperature to 190°C/375°F/gas mark 5 and bake for a further 30 minutes. Remove the loaf from the oven, carefully slide a knife around the edge, then remove it from the tin (pan). Reduce the oven temperature again, this time to 160°C/325°F/gas mark 3, place the loaf on a baking tray (sheet) and bake for a further 30 minutes. Leave to cool for about 30 minutes on a wire rack, then serve. Store in a paper bag in the fridge (as it’s quite a moist bread) for up to 5 days. This loaf freezes well, too, either whole or cut into slices (see page 17), for up to 1 month.